Thornhill had its origins after Tina Thornhill and Patty Kniss relocated to Springfield, Illinois from Ohio. With the help of some friends and family members they formed a band and began to play popular songs of the day at all the local hotspots. After some years of local success the band went on hiatus and eventually went their separate ways. After spending some time playing with other local cover bands, singer/acoustic guitarist Tina decided to turn her attention to the growing list of songs she had been writing. She enlisted Springfield guitarist Joel Zulauf to help flesh out her ideas and demos. 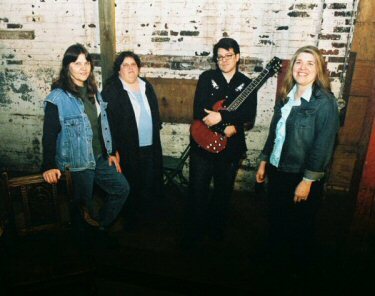 They performed for a few years with various rhythm sections until eventually Tina recruited her younger sister Lynna Thornhill to play bass guitar and Patty returned from the original Thornhill lineup to play drums. With the core lineup finally solidified, the band invited friend Terri Patterson to sing backing harmonies. Currently, the band has just released its first cd, CENTER OF TOWN, and has been diligently writing more and more material for a follow up, and is amassing quite an abundance of songs that they want to share with the world. So far, the response has been very favorable, and the band continues to win over more new fans with every performance. Click the links below to read the band member's individual biographies.